Lineapelle is a footwear trade show that occurs twice a year in Milan, Italy, and is considered one of the most important in the world in the footwear business. While Micam, GDS and other trade shows are focused on the final product, the main focus of Lineapelle is the materials used to make those shoes. 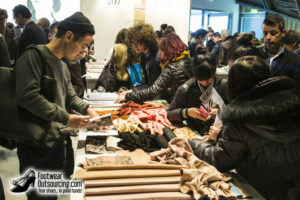 So you should expect to see a large variety of suppliers of leather, soles, fabric and many, many other materials. Due to the type of products in exhibition, their main visitors are designers looking for new materials and dealers of the aforementioned materials. The next edition will be held in Milan between February 21 and 23 2017, preparing the new trends for Summer 2018.